Meeting/dating/relationship-ing was hard enough before 2003. And then Facebook created a whole new set of obstacles, awkward conversations and unclear situations. "Can I admit to knowing things you've done (based on your pics) before we go on dates?" "Should we get to know each other on Facebook before we date?" The difficulty of dating in the era of Facebook is not just in your head, either. Researchers have found that Facebook really is altering, or at least reflecting, new relationship patterns, even how people break up. Or more accurately, don't break up. 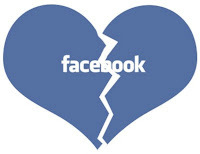 "I've been surprised at what a real impact Facebook has on romantic relationships," Galena Rhoades, a clinical psychologist at the University of Denver, told me. "And I do think Facebook is playing bigger role in relationship formation and relationship disillusions."